For the letter E, I chose ivory earrings and the matching ivory bracelet and necklace. There is not much information on the earrings. Cleora wrote: “Carved Ivory Earrings. 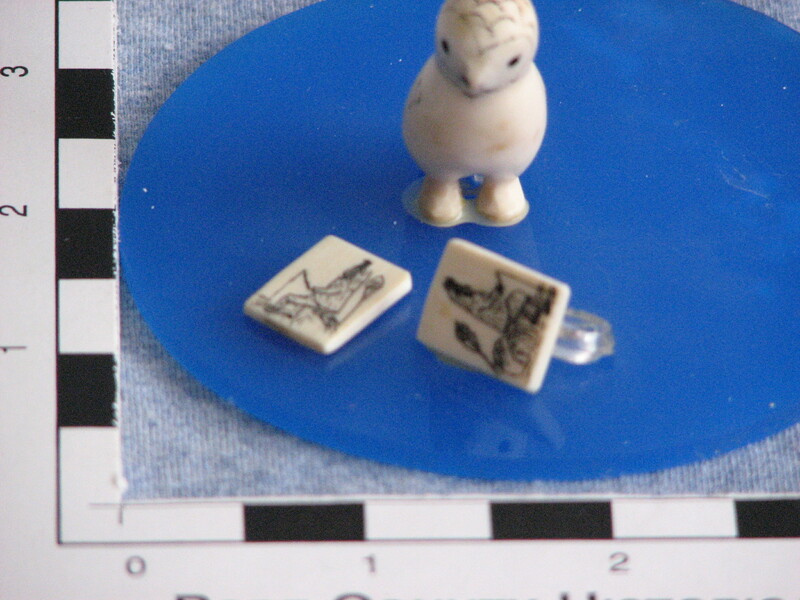 One-half inch oblong earrings carved from slightly yellowed ivory. An identical fishing scene is etched in black on each earring.” One earring has the plastic clip backing still attached. The other is just the ivory piece. To me, the most interesting piece is the matching bracelet. Each etched image tells a little part of the story of a walrus hunt. 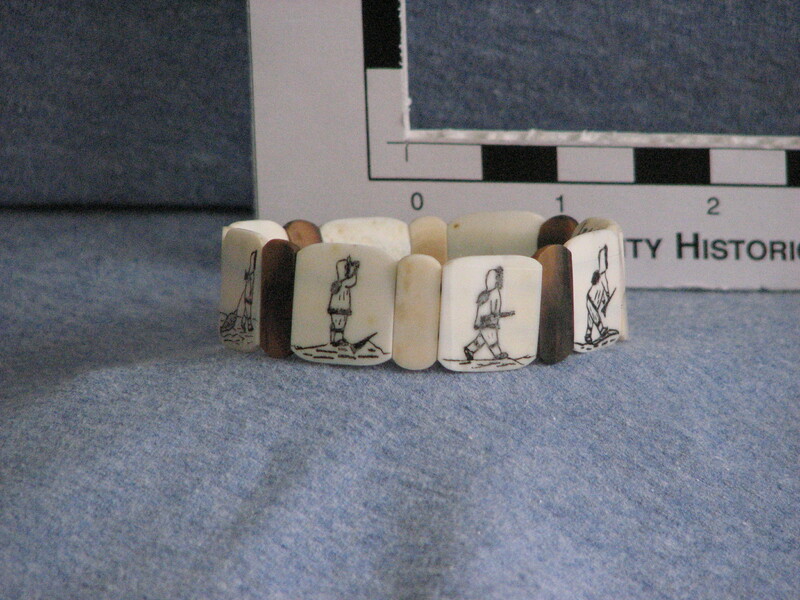 When Ronald Senungentuk (Alaskan artist) visited our museum, he said he thought the bracelet was made from Mastadon and walrus ivory in Shishmaref style, perhaps by Andrew Tingook. 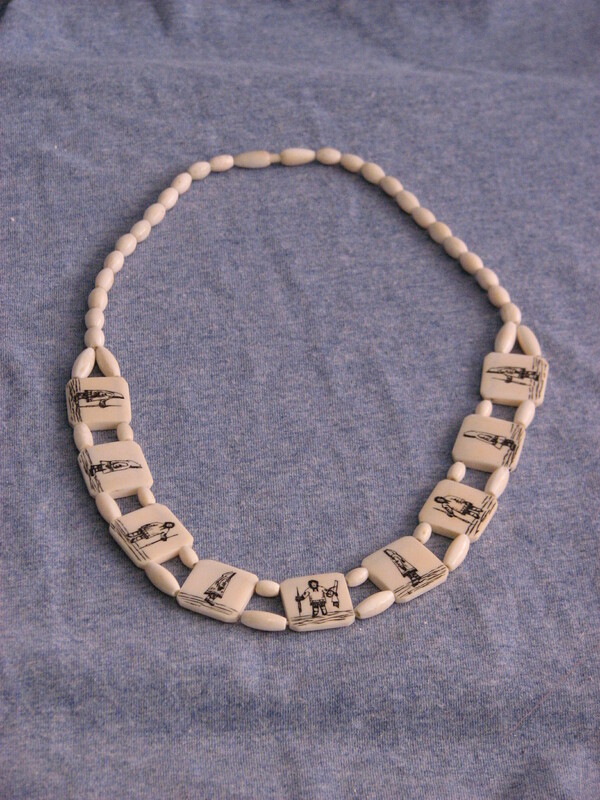 This entry was posted in Collection Notes and tagged A-Z, bracelet, Cleora Helbing, earrings, Eskimo, ivory carving, museum collection, Native American art, necklace. Bookmark the permalink. I have the exact bracelet and on the back is signed by Andrew Tingook. Mine has been restrung with a clasp. I would love to hear from you and what ypu think the bracelet is worth. I bought it in Alaska about 40 years ago. 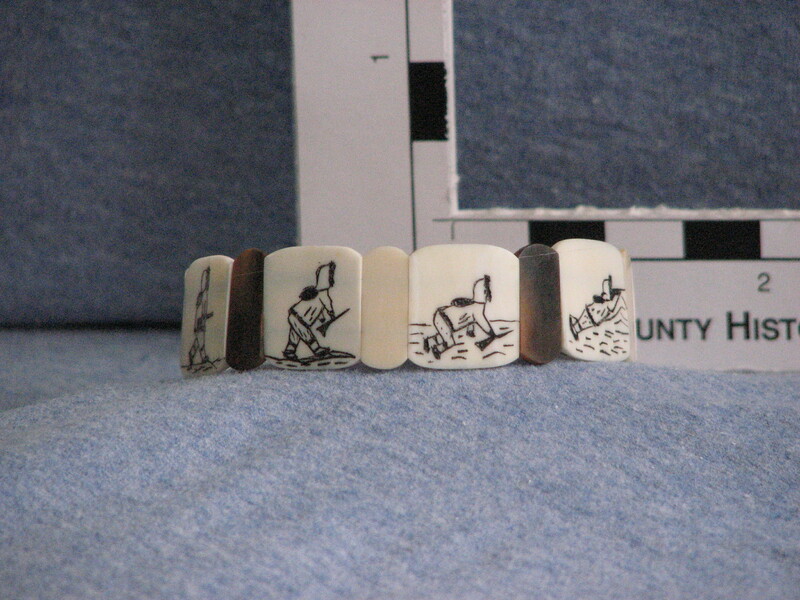 They were probably made in the same time period, our visiting Alaskan artist attributed the bracelet to Andrew Tingook as well, but we don’t have any documentation from the donor or on the bracelet to confirm that. As for a dollar value… we generally do not research monetary value here. Historic value is more important to us. I don’t know the monetary value of the ivory pieces in the collection. Sometimes you can find similar pieces on on-line auction sites, but these sites aren’t really helpful unless you know what particular features make one item more valuable than another. Also – in talking to experts, I have learned that the value of Native American Art changes frequently. Some years, certain types of crafts are very popular and therefore expensive, but a few years later, those objects may fall out of favor and become less expensive. Thanks for responding – and I hope your bracelet brings you much joy! I also have a bracelet like this. I need to get it restrung though because the elastic broke. i’ve had it since about 1964. How fortunate! Good luck getting it restrung – it should be fun to wear. 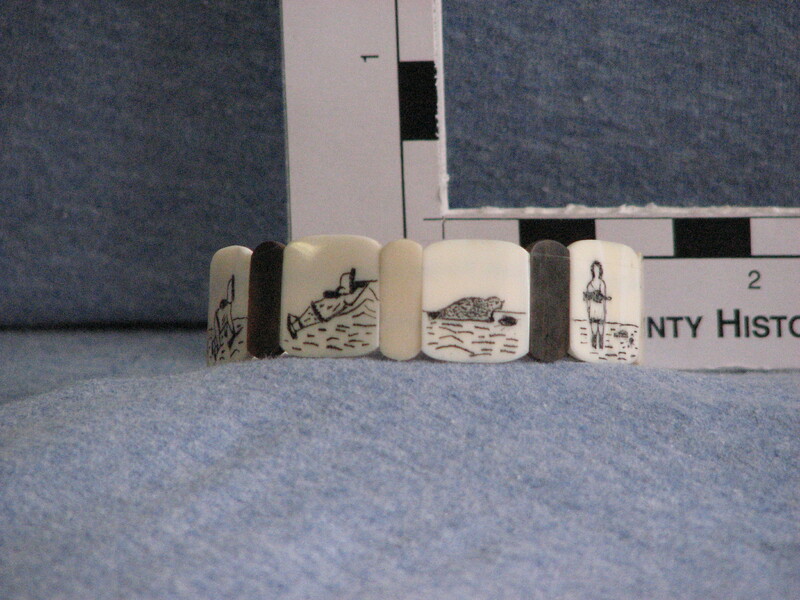 I have the simular piece that shows the whale hunt. But I also heard that the artist did not sign it. This piece was brought back in 1950’s from my grandmother that worked in Alaska. Could you give me some clarification on why it woul’nt be signed? I am not sure why your piece isn’t signed. Ours aren’t either. None of our ivory pieces are signed. Only the wooden bowl with ivory on the sides was signed – by Ronald Senungentuk. But you are fortunate to have such a wonderful piece! Enjoy!